The BMW 7 Series is the flagship sedan offering from the German carmaker. It is offered in three engine options, two diesel engine and a petrol engine. 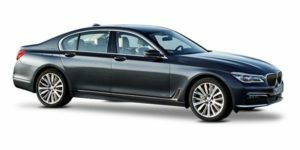 The BMW 730Ld comes four variants, 730Ld Design Pure Excellence, 730Ld M Sport, 730Ld DPE Signature and the 730Ld Design Pure Experience. The BMW 740Li is available only in one variant 740Li DPE Signature whereas the BMW 750Li comes in two variants, 750Li DPE and 750Li M Sport, both being directly imported to India. In terms of safety, the BMW 7 Series comes with ABS (Anti lock Braking System) with brake assist, airbags, electronic vehicle immobiliser and active front seat headrests. Key features include 8-speed Steptronic Sport automatic transmission, Servotronic steering assist, LED fog lights with reflection technique, executive lounge seating, automatic start/stop function, heated front and rear seats and 4 zone automatic climate control. The 7 Series has always been the more sport oriented of all the luxury sedans. It’s still a proper luxury car, but the sporty BMW character always shows. It’s no different in the new model. In fact, the 7 is now a lot more dynamic in terms of styling and even gets an M sport package as you see here. Like most of its new siblings, the 7 Series now gets a more prominent kidney grille that merges with the headlamps. It’s a larger unit and features BMW’s Laserlight like in the i8. The bumper gets LED fog lights that sit within a prominent chrome element near the air dam. The sculpted hood is typical BMW and adds to the muscular front. Move to the side and you’ll notice that the car is much longer. However, it’s still shorter in length when compared to the Audi A8L and the Mercedes-Benz S-Class. The front and rear bumpers protrude adding to the length and design. A prominent shoulder line runs across the door handles, and the C-pillar still looks a lot like the previous generation 7. The signature Hofmeister kink (the kink on the rear window frame) is for the first time a single piece in a series production BMW. There’s a lot more chrome too. The air breather surround is finished in chrome and joins the chrome strip that runs all the way along the lower side of the doors. This is a now 7 Series signature and one that distinguishes it from other flagships. The rear looks very smart, elegant and modern at the same time. The LED lamps are sleek and split by a chrome strip. The contoured rear bumper looks chunky and gets chrome surrounds for the dual-exhausts. While the previous 7 Series’ cabin design was rather conservative, the new-generation model goes all-in on the latest technology. A standard LED “light carpet” illuminates your entry as you approach the car, while you’re greeted upon entry by ambient LED lighting and the latest version of iDrive, which notably adds touchscreen functionality and the Gesture Control system. The latter strikes us as more of a gimmick than anything else, but you’ll certainly impress your passengers when you turn up the volume by moving your fingers through the air. The 7 Series’ standard long wheelbase affords truly copious rear legroom and is complemented by an unprecedented array of rear-seat luxuries, including the optional and very cool tablet-based infotainment system that’ll have you feeling as if you’re in a sci-fi movie. Bespoke touches like wood-trimmed seat belts suggest that a page has been taken from Porsche’s highly successful ultra-luxury playbook. Of course, it’s not a bad thing to be up front, either, what with the sublime available multicontour seats and nifty heated armrests. No matter where you are in the 2017 7 Series’ cabin, it’s a privileged place to be. The 7’s trunk is suitably grand, measuring 18.2 cubic feet. Additionally, a standard cargo pass-through allows longer items to poke into the rear seat via an opening in the rear seatback measuring 8 inches wide and 9.5 inches high. Ensuring you get the best out of the machine, BMW has managed to strike an elusive balance between comfort and performance. The front axle retains the now familiar aluminum double wishbone construction, while the rear employs the patent protected integral V rear axle. In order to optimize the suspension, BMW has modified the ball joints, added stiffer hydraulic dampers and new rubber bearings which have allowed the engineers to further reduce vibrations.Incidentally, all new BMW 7 Series models will now come with automatically controlled rear air suspension, which maintains the ride height regardless of load and driving conditions. Complimenting the chassis is the Electric Power Steering which is light to use but does take away in terms of absolute feedback to the driver. On the whole, the car, despite its length, drives like a sportscar and the handling is impeccable for such a car without having to compromise on ride quality. At the very limit, the old 7-series was a blast. But in everyday driving, it felt heavy from behind the wheel and its inconsistent ride marked it down further. The new car improves on the latter fronts. The steering is light enough in Comfort and the all-round air suspension has improved ride quality by a big margin. With the dampers set to Comfort, the 7-series deals with most imperfections with a lovely softness, though you do still feel a mild tremor in the cabin every time a wheel goes over something like an expansion joint. Comfort Plus is softer still, perhaps unnecessarily so, as it also adds more float over undulations and makes the ride feel unsettled. You can get by on the highway just fine with the suspension in Comfort but if you plan to drive hard, you’d be best off in Sport. Yes, you sacrifice some level of bump absorption but the Seven also becomes far better tied down with more weight to the steering and feedback from it as well. Dyed in the wool BMW fans won’t be sold on the electric power steering but it is accurate and offers a great sense of control. The 730Ld’s 50:50 weight distribution also comes into play in the corners. The big BMW changes direction without delay and for a five-metre-plus-long limousine, it feels remarkably sharp and agile. Standard safety equipment available across model series include active front headrests, multiple airbags, deactivable key for passenger side airbag, ABS with brake assist and dynamic braking lights, cornering brake light, dynamic stability control including dynamic traction control, electric parking brake with auto hold function, electronic vehicle immobilizer, ISOFIX child seat mounting, tyre pressure monitor, crash sensor, side-impact protection, rear doors with mechanical childproof lock and three-point seat belts at all seats. By just about any measure, the 2017 7 Series is an excellent vehicle. Though it’s more expensive than some class rivals, it is far from the most expensive car in the class, and there’s a lot of value with that middle-tier price tag. The 7 Series features several powerful engine options, including a plug-in hybrid powertrain that’s new for 2017. The base 7 Series is more fuel-efficient than rivals, and it has one of the largest trunks in the class. And in a class that’s often judged by how luxurious the rear seats are, the 7 Series stands out for providing plenty of rear-seat comfort features and more legroom in the back than pretty much every rival.